Europe has a long and rich history of delivering public goods and services through public institutions. Publicly-funded cultural heritage institutions contribute to our identity, and encourage learning and creativity. Public libraries serve as knowledge hubs and play an important role in providing access to marginalised groups. Public schools and universities are the bedrock of our educational systems, and public service broadcasting organisations ensure the provision of quality news and information and allow for diversity of cultural expression. Public institutions are also best placed to assure broad democratic civic participation on how our knowledge, science and culture are governed. The digital revolution has created the preconditions that would allow these institutions to better fulfill their missions by actively involving communities in decision making and the generation of culture. The Internet provides them with more ways to reach (new) audiences and to decouple their activities from the restraints of place and time. At the same time these institutions and the values that are embedded within them are under attack. This challenge comes in two different forms. In many countries, there is increasing pressure on the independence of these institutions by governments. In parallel, large commercial market players question the very logic of public provision of public goods and services in attempts to grow their own markets. As a result, the potential of public institutions and small and medium sized digital companies to uphold inclusivity, democracy, and equality of our societies in the digital age has been largely dormant; many of these institutions struggle to find their role in the digital environment. If we understand the Internet as a market-driven platform dominated by global conglomerates and not as a basic universal service and a public infrastructure, we abandon our ability to protect our democratic systems and to shield citizens from over-commodification. Our current policies in the digital area fail to empower public institutions, and instead hold them back from innovation in the delivery of public services. Outdated and inflexible copyright laws are limiting research and education and prevent cultural heritage institutions from sharing their collections online. Public service broadcasters are reduced to continue providing linear programming that mimics the radio and television channels of the 20th century instead of developing online-first strategies that can challenge the attention-monopolies of social media platforms. Education and learning is confined to formal educational institutions instead of embedded in the fabric of everyday life. The majority of these limitations are undertaken in order to "protect" the market from undue competition. Instead of envisioning the Internet as a true public space in which publicly funded institutions play an important and visible role as producers of content, they are confined to the margins. The lack of strategies for a digital transformation of public institutions means that we have largely surrendered the digital environment to the ever-increasing influence of commercial online platforms that erode our democratic values. A Europe that seeks to develop its own position in the digital age that is true to its decades-old tradition of public institutions needs to empower these same institutions to provide meaningful services and to provide the public with shared online spaces that are protected from the surveillance practices of commercial platforms. It should also support institutions that need to transform digitally, in order to be strong stewards of these spaces. Europe must embrace its public institutions as key elements of building a Shared Digital Europe that protects our democratic values and strives for equity and social justice. This requires investment in these institutions and updates to the regulatory frameworks to remove the limitations that have been placed on them. 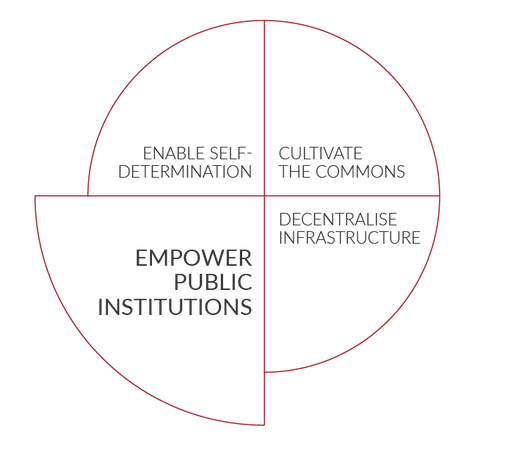 Instead of slowly eroding these institutions in the interest of an ever-expanding market sector, it is necessary to create strong public institutions that can compete with commercial platforms when it comes to access to information, knowledge, culture. Public institutions should take the lead in ensuring that our values and democracy can flourish in the digital age. Public institutions should put a focus on using digital solutions to build partnerships with citizens and establish online public-civic spaces. In this way, democracy will be enhanced and the public interest safeguarded. In such partnerships, citizens must be provided a greater role in the stewardship and governance of such spaces and available resources. This also requires regulation that favours decentralised and community-based initiatives and governance.